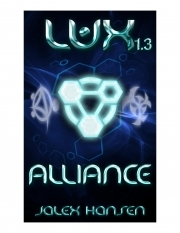 Description of "Lux 1.3 Alliance (Lux Series) (eBook)"
Alliance is the third book in the Lux series. Jalex Hansen has an affinity for creating stories of rebellion, challenges and self-discovery. She believes that, in a perfect world, everyone would have a voice and writing would be the ultimate weapon. Jalex has been known to engage in lightsaber fights and airsoft wars. She is inspired by strong women, unsung heroes, and large amounts of ice cream. Sometimes she writes. Reviews of "Lux 1.3 Alliance (Lux Series) (eBook)"